It is always a challenge to decide the next holiday destination that can add adventure to life. Everyone find adventure as an attractive activity and for the few who don’t find it attractive, they have their own way of making life exciting. Here is my list of adventurous places. • East Africa is considered as the last stronghold of Lion, Elephants and Gorillas. • Kenya and Tanzania are some of the awesome places for watching wildlife with safari trips around Mount Kenya in Kenya and Mount Kilimanjaro in Tanzania. • You can experience walking safaris in Zambia with a breath taking view of the Victoria Falls with an average of 546 million cubic meters of water falling per minute. • With the most treacherous waters on planet earth, the area is inhabited with great white sharks that attract a good number of tourists. • Gansbaai is the top destination in the world to watch these deadly creatures closely. • You can play it safe and watch these white sharks and whales from the sandy shores of one of the best beaches of pearly. • The country is also famous for safari adventures. • Sight-seeing can prove to be so exciting with new surprises. • Angel falls in Venezuela happens to be the tallest planet on earth ranging at 3212 feet with a 2648 foot plunge and also sloped cascades that stretch for almost quarter a mile. • Despite the place being in a remote area, the country has other beautiful attraction sites with several hotels to make your stay there comfortable as you could wish. • Australia being a continent, it has a lot to offer to tourists. • Australia has some of the best adventure travels from the oceans to the mountains from which you can choose from Beach life is also so interesting and exciting. • Have an adventure trip on the rocks of New Zealand. It has a rich culture and roots of Polynesian tradition. • When you are in New Zealand you definitely don’t want to miss a like performance of Kapa Haka. • With warm and friendly people who always give a hand, India has all that tourists would wish to experience. • Enjoy the ocean waters and climbing of the Himalayas that happens to be one of the challenging adventures in the country. • You can as well visit the wettest place on earth Mawsyrnam that holds the Guinness book of record after receiving 1000 inches of rainfall in one year. • Chiang Mai in northern Thailand is a city with friendly people offering delicious meals and native fruits. You can as well spend the day exploring the Chiang Dao caves. 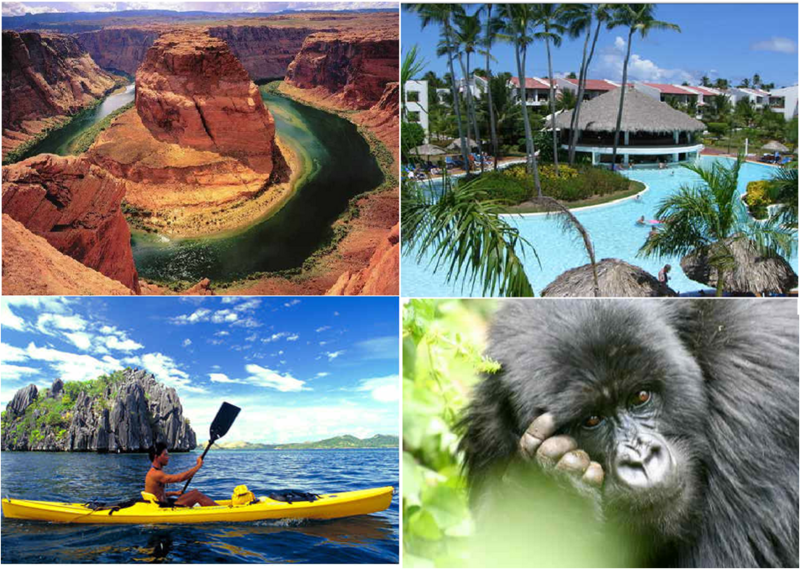 • The Amazon River, the tropical wetland, Igauca falls among other sites make it interesting in Brazil. • This happens to be the steepest peak on earth and for mountain climbers it tends to be a challenging activity. • Whatever makes you excited, whether beach holiday, about culture or traditions and ancient past of turkey, you will definitely get it in the country. •It has beautiful mosques, beaches, mountain range. You wouldn’t want to miss the food and make sure to have a mouth full of Turkish delight. • It is a requirement to have a turkey visa before traveling to the country and you can get it from the Turkish embassy in your country. • This country has the highest mountains in Europe, for mountain climbers, this happens to be your next destination. • It has excellent trails and the best public huts in the world. For summer activities, visit the country on June to September and February to march for northern lights and skiing. Ruth Anoya is a passionate blogger, living in UK. She writes on behalf of Turkey visa . She loves to write as a guest blogger with interest in Travel, Health and Automotive.